The M Series spectrometers offer ergonomically designed, dual atomizer, multi-element AA systems with a footprint of less than 0.5 sq. m. Employing a unique echelle optical system to cover the range 180nm to 900nm (with wide range PMT option), it sets a new standard of performance. Pre-aligned flame (left hand compartment) and furnace atomizers (right hand compartment) can be selected purely by software means, so that automated changeover in a method is possible. A 6 lamp auto-aligning turret (using data-coded lamps with individual power supplies), pencil beam optics and Stockdale double beam system combine to produce exceptional trace element detection limits. QuadLine deuterium background correction is standard on all units, even when equipped with the optional Zeeman system, and provides guaranteed correction performance. 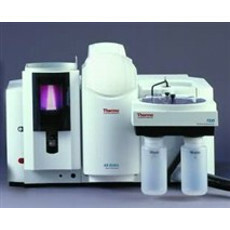 Find the Thermo Scientific SOLAAR M Series you need and shop from a wide selection of vendors. Buy now or request a price quote.